Dust off your bell-bottoms, lace up your platform boots, grab your glam-rock sunglasses, and get out your wallets to support the Pacific Pinball Museum’s restoration of Alameda’s Carnegie library building! Join us at the historic Alameda Theatre for a special 40th anniversary screening of The Who’s iconic pinball film “Tommy,” as we raise funds to reopen the Carnegie library to the public as the new home of PPM’s expanding collection of pins from the 1800s to today. Please note: “Tommy” contains material that may not be suitable for children. Costumes are encouraged but not required. 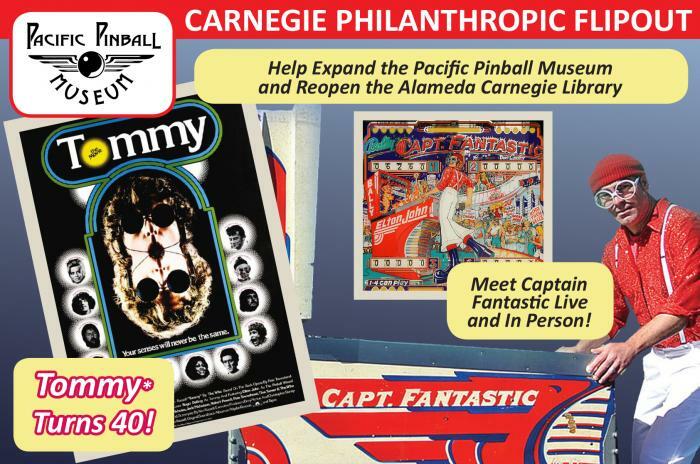 All proceeds from this event go directly to support the restoration of Alameda’s Carnegie library building as the new home of the Pacific Pinball Museum, a 501(c)(3) nonprofit organization dedicated to teaching art, science, and history through pinball, and preserving and promoting this important part of American culture.